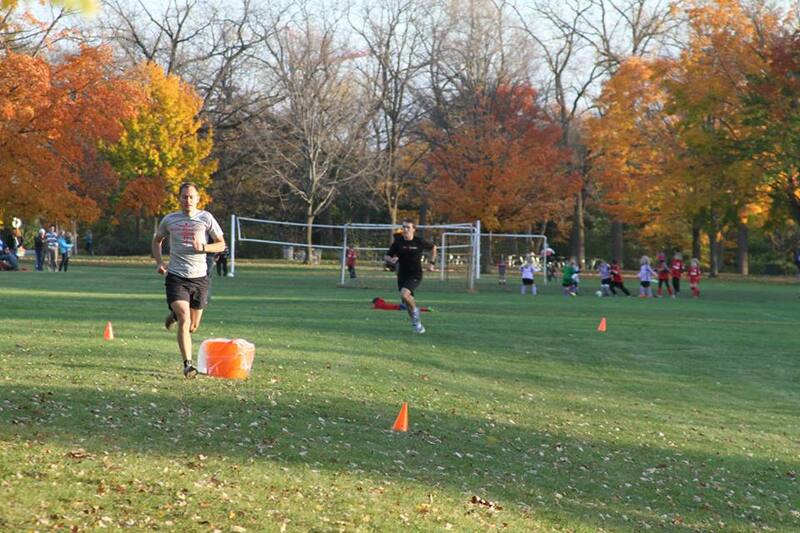 Think you’ve got what it takes to run four laps and drink four beers in less than 30 minutes? Milwaukee Running Group OMG – for those of you not in the know, OMG stands for Original Milwaukee Group – is hosting its third annual Beer Mile this Saturday. It’s an event you won’t want to miss. Whether you’re running or spectating, it’s sure to be a great time! Below, OMG organizer Patrick Bieser, tells us more about this year’s event. When is this year’s Beer Mile and where will it be run? The third annual Beer Mile OMG will be run on Saturday, August 20th starting at 5pm at the Rugby Field at the Lakefront. The event is free. We will be attempting to break the Group World Record for the Beer Mile established last year. Who can participate and how can people register? Anyone who can run four laps on a 400-meter track while drinking four beers can attend. In past years, a few Beer Mile pros completed the challenge in less than 7 minutes, but most people take 10-20 minutes. Registration, race details and a map to the rugby field can be found on the Milwaukee Running Group website – www.milwaukee-running-group.com. How did the OMG Beer Mile get its start? We first heard of the Beer Mile a few years ago from a member and knew immediately this would become our signature event. OMG has more than 600 members, and the Beer Mile is our only official race. With so many excellent local races hosted by Badgerland Striders, we didn’t see a need for more. But a race with beer as the main challenge? That was a clear and present community need, and a perfect fit for OMG. We wanted our Beer Mile to be a group event and encourage those who have not yet developed a love for beer to participate. To accomplish this, we designed the race to be less about individual times and more about having fun and giving back. We encourage costumes and a charity donation. We allow relay teams. We throw in an after party and an outdoor movie for good measure. This will be our third year hosting the Group Beer Mile and participation has doubled each year. Can you explain how the event works? What rules do participants need to follow? The official “Group Beer Mile” rules were established by OMG and were adapted from the rules for individuals posted at Beermile.com. 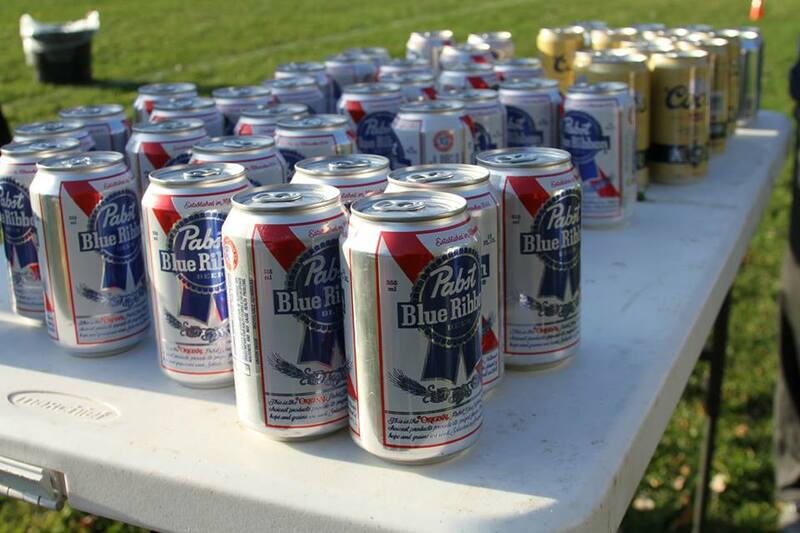 The Group Beer Mile consists of four beers over a 1-mile course. For smaller groups, this is done on a standard 400-meter track. One beer per lap, four laps. The records are set for the most people completing the Beer Mile in less than 30 minutes. There is only one major rule changes for groups. The Group must raise money for a local charity with some sort of link to running. Each individual will drink four cans of beer and runs four laps on a track (Start – beer, lap, beer, lap, beer, lap, beer, lap – Finish). The group world records are established by 1) counting the number of group members who cross the finish line in under 30 minutes and 2) recording the amount of money raised for charity. Any group member can drop out at any time without penalty, but the “group” record is set based on the number of people who finish, including penalty laps. Relay teams of 2×2 and 4×1 are allowed. Times for relay teams are recorded separately. Beer must be consumed before the lap is begun. Competitors can drink canned or bottled beer and the cans/bottles should not be less than 355ml (the standard can volume) or 12oz (the imperial equivalent). No specialized cans or bottles may be used that give an advantage by allowing the beer to pour at a faster rate. i.e. “super mega mouth cans” or “wide mouth bottles” are prohibited. Beer cans must not be tampered with in any manner, i.e. no shotgunning or puncturing of the can except for opening the can by the tab at the top. The same applies with bottles – no straws or other aids are allowed in order to aid in the speed of pouring. Beer must be a minimum of 4.5% alcohol by volume (this allows for Pabst, the official OMG beer). No hard ciders and or lemonades. 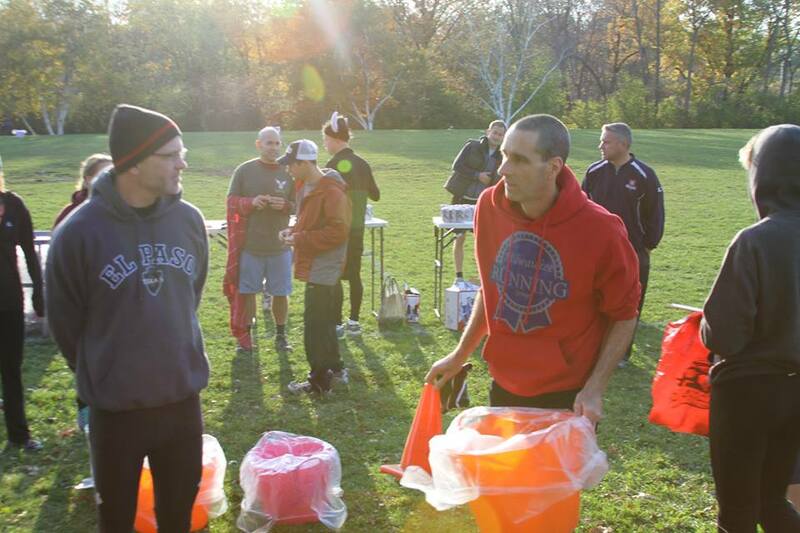 If attempting official records, runners should tip the empty beer can or bottle over their head at the end of a chug to verify an empty vessel. Is this an event people can train for? And if so, what do you recommend? Training is recommended if you’re serious about your race time. The hardest part is drinking fast and running with an overload of carbonation. One way to train is to try to finish a beer while watching a political ad on TV. The timing is right, and the alcohol blunts the messaging. Can you tell us more about the world record aspect of the event? How many participants do you need this year to break the record? Two years ago Milwaukee set the Group World Record for the Beer Mile at 26 people running, and last year we smashed it with 42 running. We are on track to break the record again this year. Beermile.com does not record or even mention Group World Records, but since Milwaukee is the beer capital of the world it is only proper and fitting that a local running group take up the mantle and establish the Group World Record. What have been the winning times for men and women? Any contenders for the win this year? The men’s winning time last year was 6:46 set by James Burke. The women’s winning time was 9:48 set by Christina Lundberg. Local Beer Mile hero Tim Cigelske didn’t run last year, but he is signed up this year and could challenge the record. We hear that he’s been training. Has anything crazy or unexpected happened during previous years? Like spectators at auto races waiting for a crash, spectators at the Beer Mile wait for someone to vomit. Fingers point and bets are made and lots of loud burps can be heard, but thankfully vomiting only occurs about as often as Kanye and Taylor Swift go on a date. Last year several people showed up in jeans and street shoes and decided to run. Several members of a bachelor party dropped by to spectate and decided to run. The energy at the event is infectious. Lots of people wearing costumes, fake mustaches, a stay puff marshmallow woman, wigs and team t-shirts. Yes. It’s as much fun to watch as it is to run. Attendance is half runners and half spectators. What are some of the other activities around the event? After the run, our alcohol addled brains tell us it’s time to watch a classic movie. This year it’s the Blue Brothers! We took a poll and half the people asked (the millennial half) have never seen this important piece of American history. In the spirit of patriotism in this election year, we felt a movie about two men on a mission to save an orphanage, with some beer and music thrown in, was as American as we could get. Thanks so much for chatting with us, Patrick! If you’re up for giving the Beer Mile a try this weekend, learn more and register at www.milwaukee-running-group.com. This entry was posted in Race Previews and tagged Milwaukee Races, Milwaukee Running Group OMG, Race Previews, Running in MKE, Upcoming Events. Bookmark the permalink.